Joining other moons in heralding the coming of Saturn's August 2009 equinox, the moon Tethys casts its shadow across Saturn's F ring and part of the A ring. 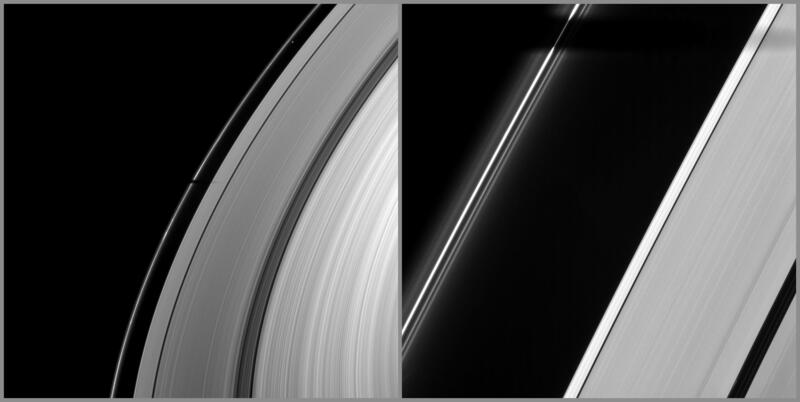 The penumbra, or outer non-opaque part of Tethys' shadow, has intersected the A ring. 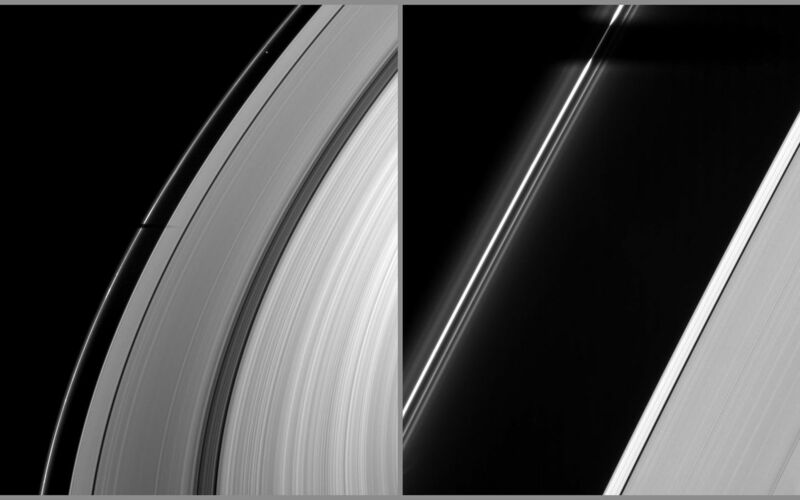 Only around the time of equinox are the shadows of the moons cast onto Saturn's rings. For an animation of the moon Epimetheus casting a shadow on the A ring, see PIA11651. 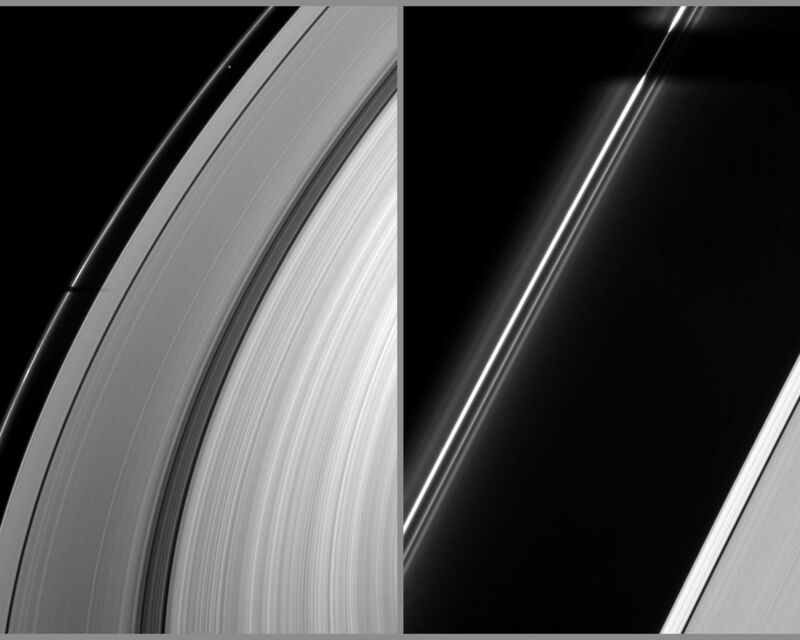 The image on the left was taken in visible light with the Cassini spacecraft wide-angle camera on March 20, 2009. The image on the right was taken with the narrow-angle camera at nearly the same time. Tethys itself is not visible in these images, but the small moon Prometheus (86 kilometers, or 53 miles across) can be seen between the F and A rings in the top of the wide-angle camera image. This view looks toward the unilluminated side of the rings from about 37 degrees above the ringplane. The view was obtained at a distance of approximately 880,000 kilometers (547,000 miles) from Saturn and at a Sun-Saturn-spacecraft, or phase, angle of 124 degrees. Image scale is 49 kilometers (31 miles) per pixel in the wide-angle image. In the narrow-angle camera image, the scale is 5 kilometers (3 miles) per pixel.